Dataran Pahlawan is one of the famous malls in Malacca. It is consider as a megamall which is happening and relishing heritage yet refreshing the indulgence. 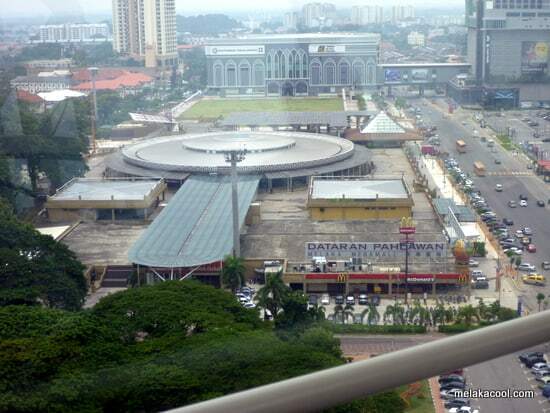 Dataran Pahlawan is a modern style shopping mall with many branded items to be chosen. If you are a shopaholic, I would definitely suggest you to visit this place. The environment is suitable for both youngsters and families. Dataran Pahlawan Melaka Megamall is located in the centre of attractions in a place that used to call Dataran Pahlawan. It is quite near with the Taming Sari Tower, Malaysia Royal Navy Museum, A Famosa and Equatorial Hotel. This mall is fully equipped with toilets, ATM machines, money changer, nice food courts and also prayer rooms. Visitors could choose various types of restaurants and cafes around the mall. There is also a McDonald’s fast food restaurant next to this building. The tenants in this mall mostly from very well-known brands such as Planet Ape, Elianto, MyNews.com, MNG, Giordano, Padini, Aussino, Scholl and much more. Apart from all these shops, there is a place where you can see various types of Koi fish at the Ground Floor near the back exit door. The pond is made with very nice sculpture on the wall which is related with Malacca history. That place is the most favorite place to hang out with family members after a hectic stroll around the mall. There is a heritage bazaar inside this mall. The bazaar promotes local crafts and foods. If you plan to get some souvenirs, you can definitely get it here. The price is almost the same with the other souvenirs’ shop around Malacca. Nevertheless this place is much more convenient. There are many gift shops with unique designs. If you plan to visit Dataran Pahlawan Mall by bus, you can get on town bus service for bus number 16 or you can hop on to SKA bus with the code MP (which stands for Mahkota Parade). Both buses start their operation from 6.30 in the morning and ends at 10.00 P.M. You should have no worries since the bus is on service every 10 minutes interval time. If you want to take a taxi ride, you can call 06 – 288 2525 from 9 A.M. to 5.30 P.M.